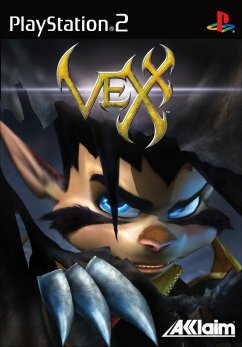 Vexx is a bit of a funny title for the PS2. Not because it's a platformer, which it is and a good one at that but that it does defy certain conventions as far as "rules" of gaming are concerned. These are both to the detriment and good side of Vexx, which certainly made it an odd one to review. The story to this title is largely forgettable as is too often the case in platforming titles which is more the pity. Let's just say that good times turn bad and Vexx is on the warpath with a pair of oversized taloned gloves that he can use to slice and dice his opponents. One of the first things you will notice about this game is the sheer size of the levels. These are very impressive and the draw size of each map is excellent with players able to see far off items in the distance. The odd thing is that despite how far you can see, you cannot see the enemies in the distance despite being able to see everything else. 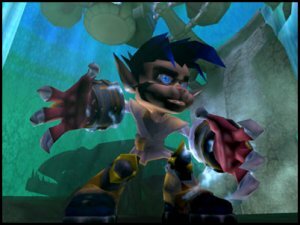 Vexx is blessed with being able to do everything immediately at the start of the game, unlike other titles where you slowly have to build up your powers as the intensity and difficulty increases in the title. I was perplexed by this as when it came to battling foes face to face it was almost too easy as a rule to take them on and defeat them. That said however, it is easy to just run away and do platformy kind of things which are in abundance. Graphically Vexx is a strange creature as well. 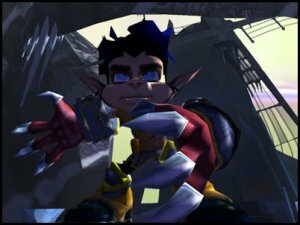 The graphics are not the best, in fact there are some times that I thought that the graphics were just a notch above those of the PSone, however they are animated well and everything moves fairly smoothly with occasional chugging when the action heats up a bit. I am going to make this comment here even though it pertains to more than this title. Developers, when you make a title for a console, make it work properly! It's inexcusable for a console game to chug along badly enough to noticeably lower framerates. 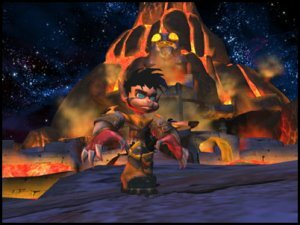 As far as the main thrust of the story goes, Vexx is a lot of fun as a platforming title and incorporates a lot of the fun of other well known titles. There are puzzles to solve in order to proceed and also a neat feature in that the day progresses as you do. So we get to see the gameworld all the way through from sunup and sunset, with little changes taking place as the world got darker. They could have done a lot more to explore this cool feature further however it was nice to see regardless. There are also sundials that you can stand on during the game that will let you manually affect the time of day as well. A great initiative that was not exploited as well as it should. It's surprising that there is not too much going on soundwise with this game. Vexx himself makes hardly any noise and neither do enemies in the game. There is not a lot of voice acting in the game and what's there is not enough to truly judge it all by. The game's music is certainly nice and differs depending on what is happening. What sounds there are do treat the ears and the game supports Dolby Digital. I think that this game will more than suit fans of platforming games, although I must warn that the title itself is huge in scope and without any really hard tasks to undertake, there is a chance that you may tire of the game. I thoroughly enjoyed the title however I am a nut for platforming games. I do recommend it to readers, however you might even want to hire it first if you are even slightly unsure of this game.